It's time for the last sketch for 2015 at Kortskissen, and it happens to be a sketch I created. 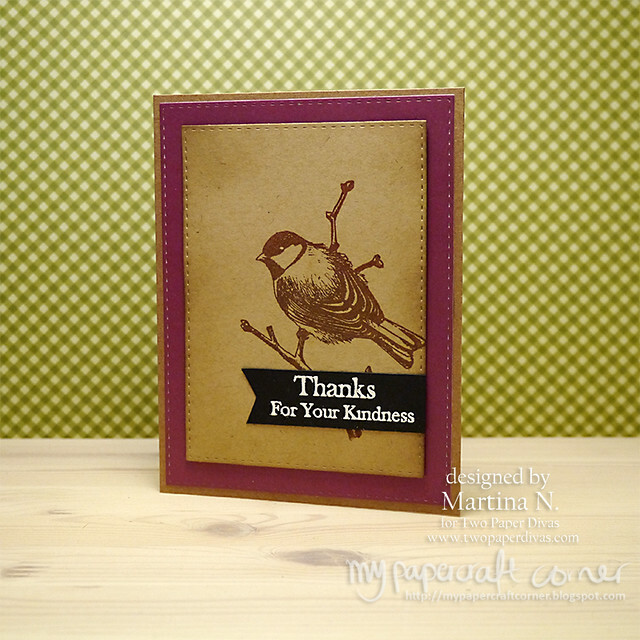 I made this card with stamps from Hero Arts and Lawn Fawn. Thanks for stopping by and I wish you all a Happy New Year! I will be back next year. Hope you had a wonderful holiday! I wanted to do something else than holiday cards so I thought it would be fun to create a thank you card and play with my watercolors in some colors that reminds us about the next season, spring! 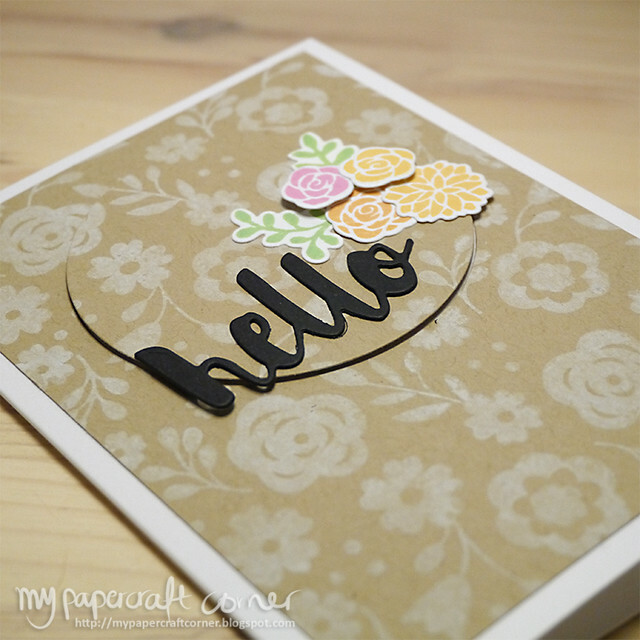 I used a flower stamp from Two Paper Divas to create my own panel. I masked the stamp and embossed it multiple times on watercolor card stock. The colors for the watercolor panel are my Kuretake Gansai Watercolors. I used Perfect Pearls in my water so the panel is very shimmery. Unfortunately it's a little bit hard to catch it in the photo. 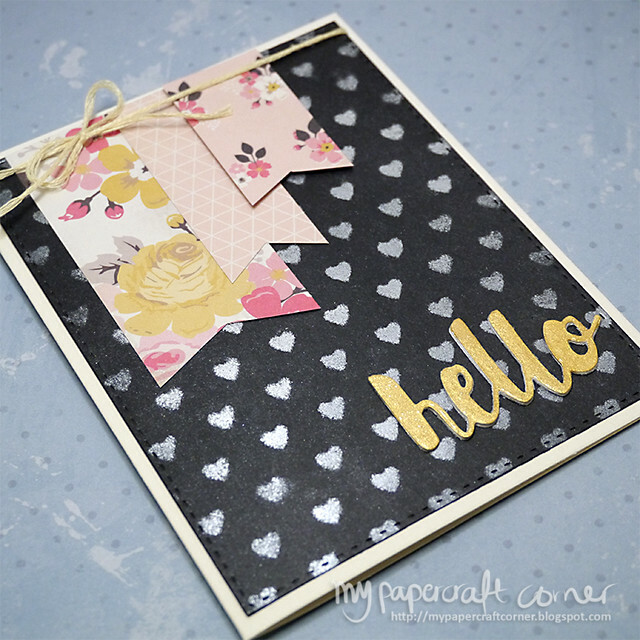 I used my DIY-heart stencil with embossing paste and glitter embossing powder. 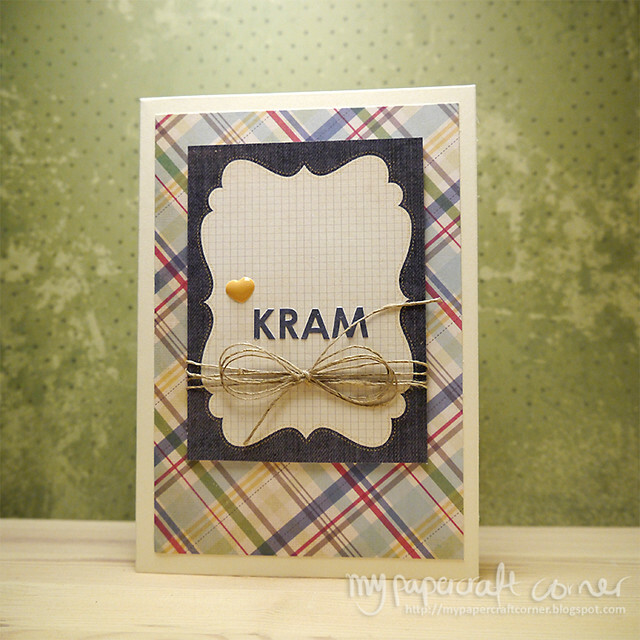 Today it's a new card based on a card from Kortskissen #336. 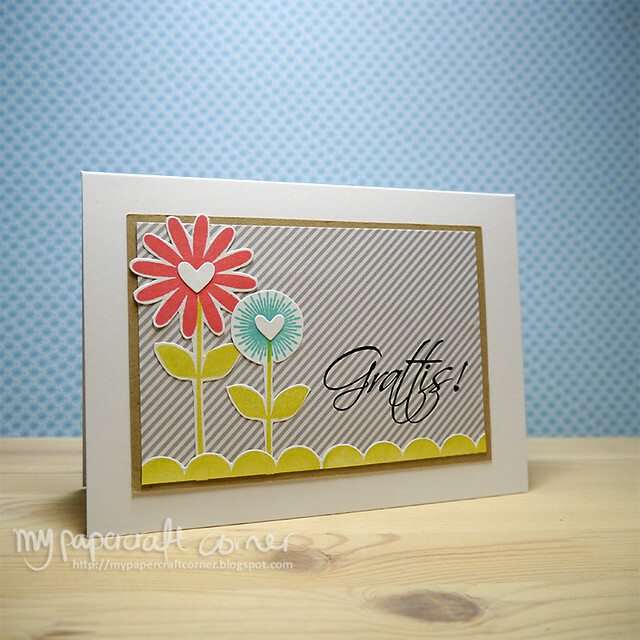 I used some patterned paper and a stamp set from a Simon Says Stamp card kit. Please visit Kortskissen for the other beautiful cards. Have a nice holiday! It's been a crazy week for me, but finally I could spend some time in the craft room. 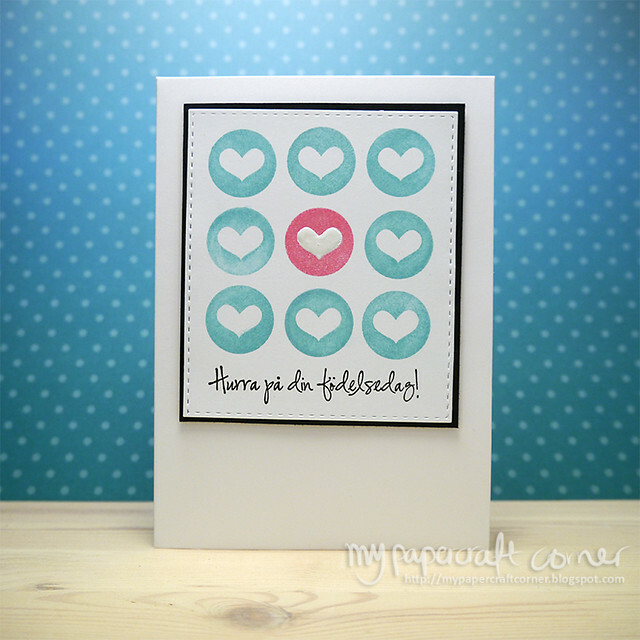 I made this card with the stamps from I Chews You stamp set from Two Paper Divas. 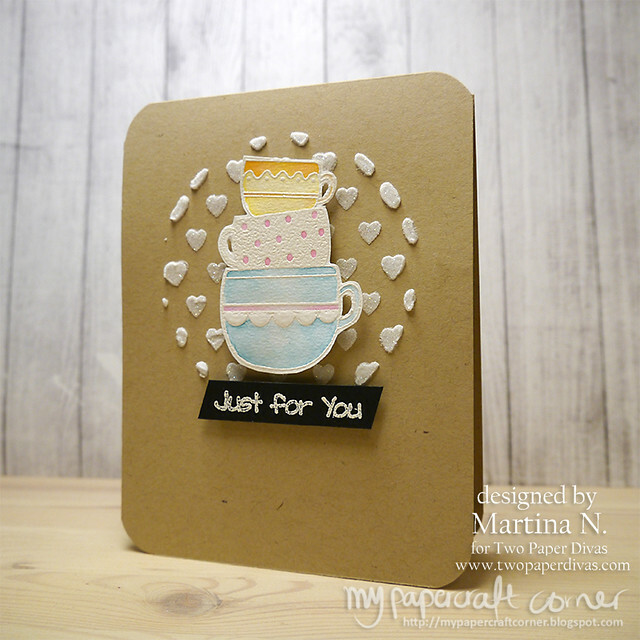 The card is based on a sketch from the challnge at Sweet Sunday Sketch Challenge 300. I colored the image with Distress Markers and created my own background paper stamping the small hearts repeatedly. 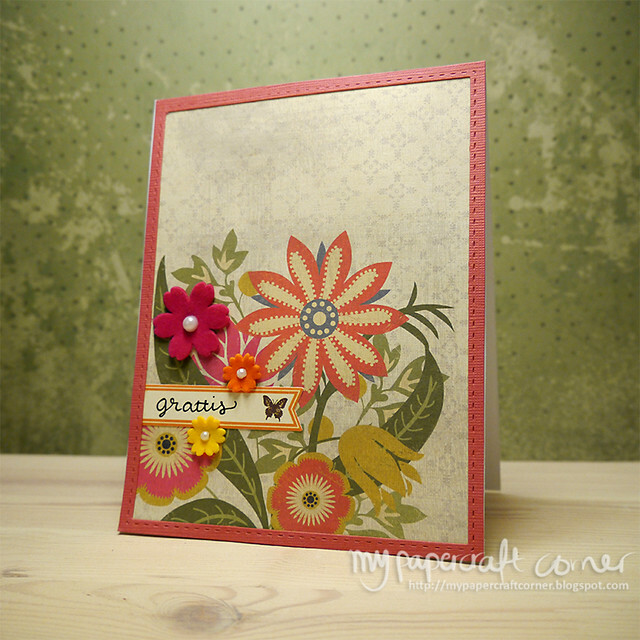 The patterned papers comes from an older card kit from Simon Says Stamp. Simon Says Stamp Ink, Versafine ink. Today it's time for a new interpretation of s sketch from Kortskissen. 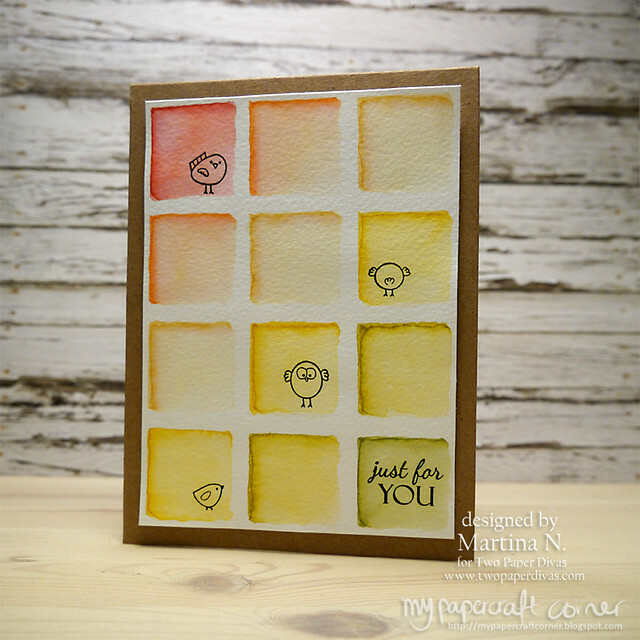 I created my own background with a stamp from Hero Arts and Distress Inks. It's almost a one layered card, it's just the vellum circle on top of the background. Hope you had a nice week and weekend. For this weeks card with stamps from Two Paper Divas I created my own background with the new stamp, Heart Blocks and I used the sentiment from the stamp set Everyday Sentiments #3. Have a nice day and thanks for stopping by. Today I share another card for Kortskissen. I used stamps from Hero Arts to create my own background paper. 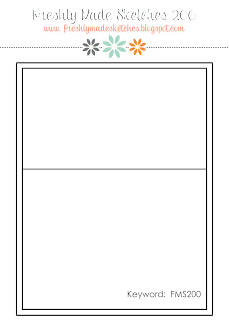 The sentiment stamp comes from Inkido. 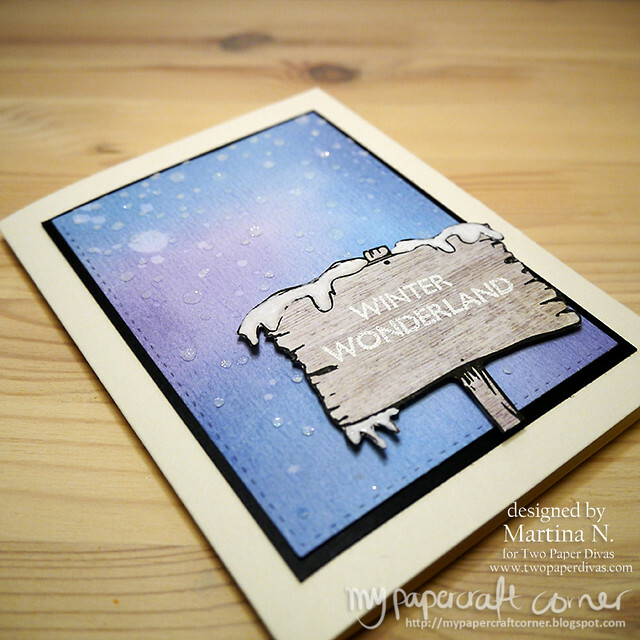 Today it's time to share stamps from the new December stamp release from Two Paper Divas. 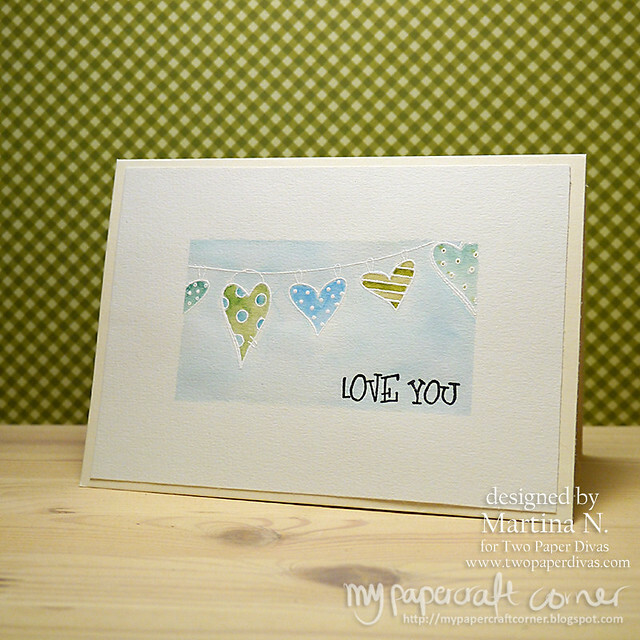 I created almost a one layered card using the String of Hearts stamps and colored it with Distress Markers. 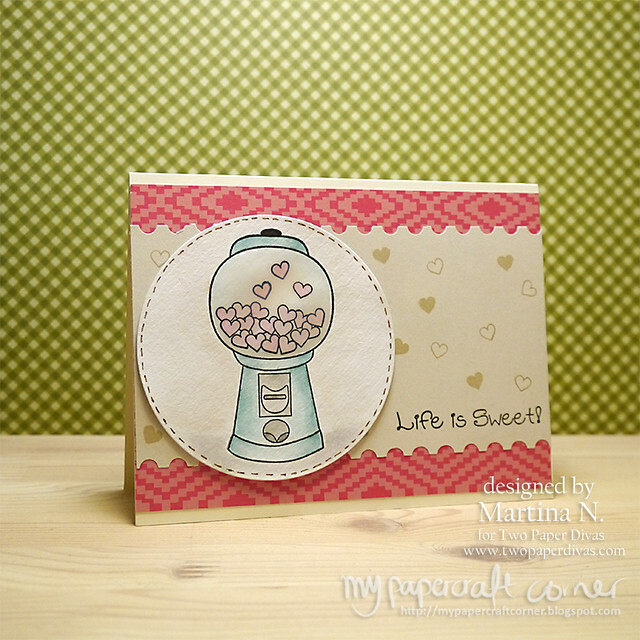 I created my own sentiment with stamps from Large Conversation Heart stamp set. You can find more information here: Two Paper Divas. I got inspiration to the colors from the challenge at Less is more week 253 colour green and blue challenge. 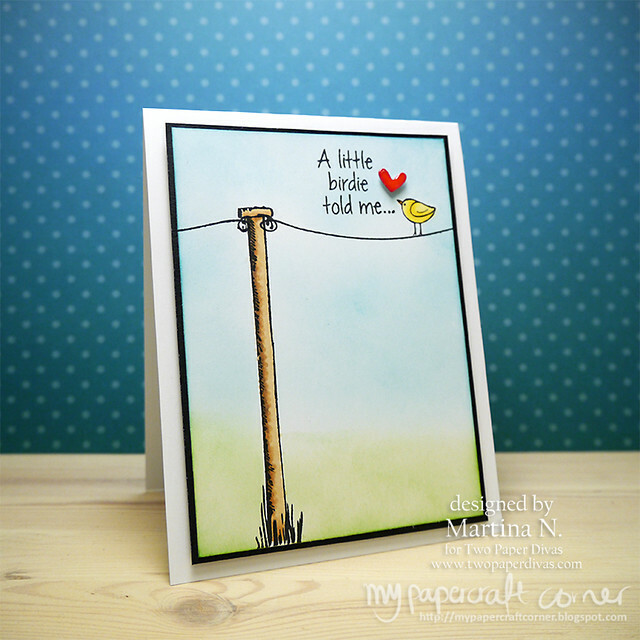 I found the sketch from Freshly Made Sketches 214 inspiring so I used the Sing like a bird stamp from Two Paper Divas. I challenged myself to use a different color scheme than I normally do. 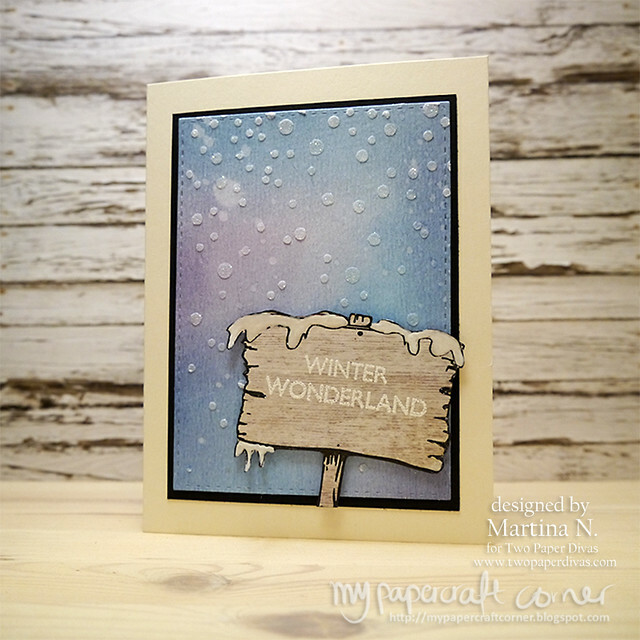 Today I'm showing you a one layered card based on a sketch from Kortskissen. I used a stamp set from a Simon Says Stamp card kit. The background is inked with Distress ink and sprayed with Perfect Pearls. The sentiment is white heat embossed. 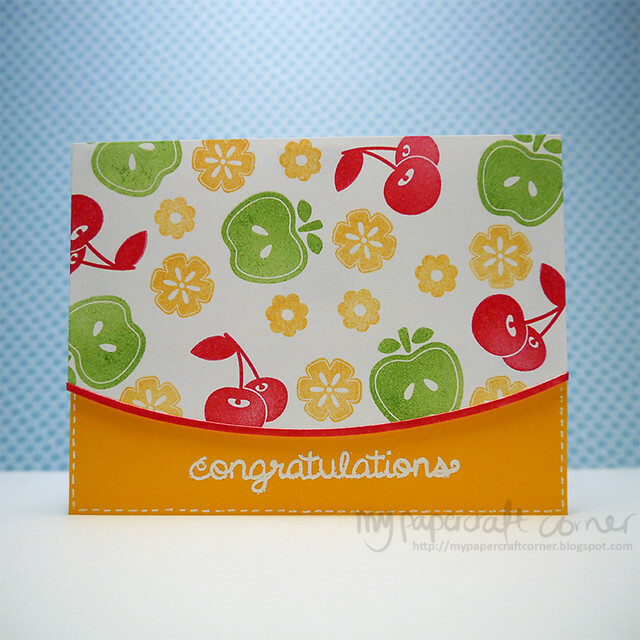 Patterned Paper from Simon Says Stamp card kit. 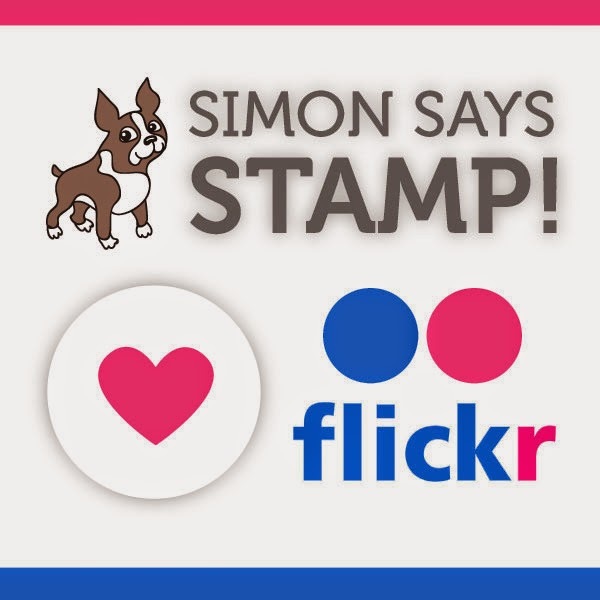 Simon Says Stamp heart die. Hope you had a nice weekend. Mine was full of house renovation! But I had time to make a card with stamps from Two Paper Divas. 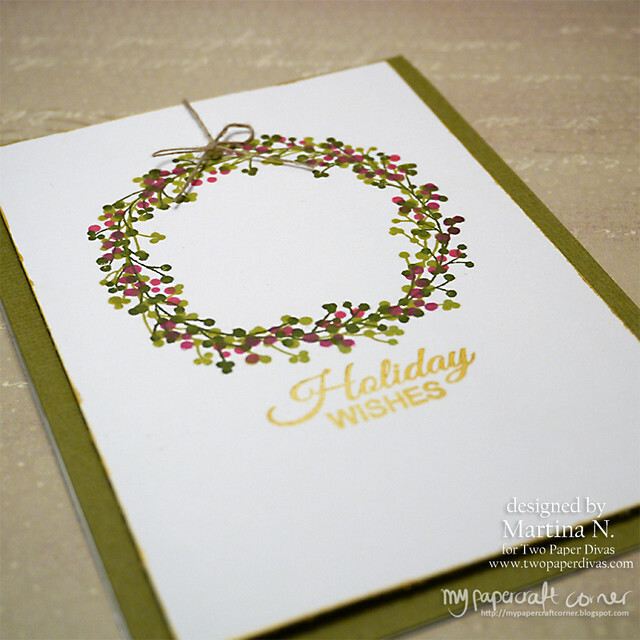 I used the stamp Twig & Berry wreath to make a holiday card. 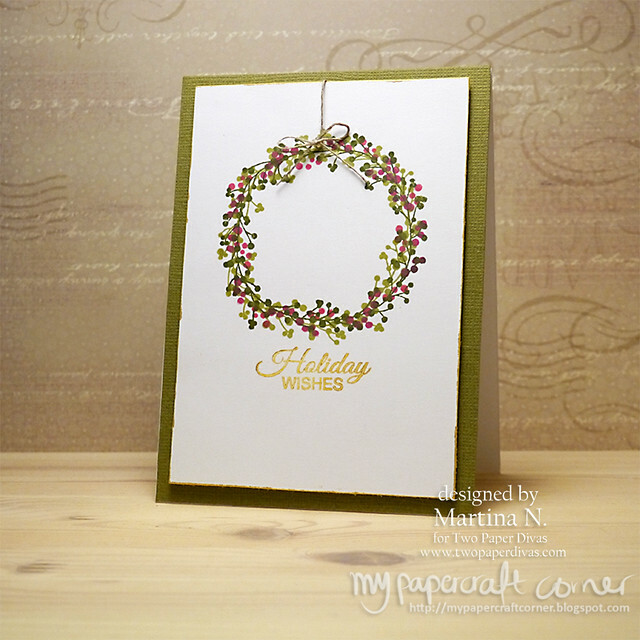 I stamped the wreath twice with different green inks and added berries with two red colors. Stamps: Twig & Berry Wreath, the sentiment comes from the Truffle Treats stamp set, both from Two Paper Divas. It's time for a new sketch at Kortskissen. 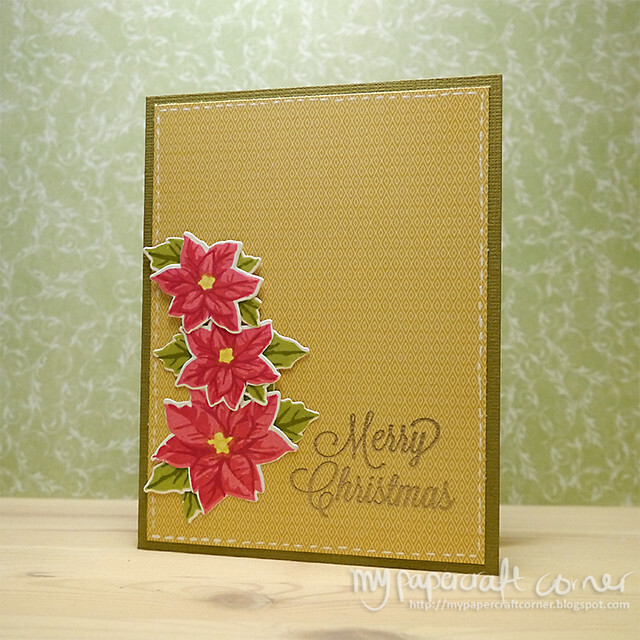 I wanted to use my new kit-supplies from Hero Arts and the sketch was perfect for the Poinsettia stamp set in the kit. Please check the other cards over at Kortskissen. It's so dark and grey here in Sweden now when it's Autumn so I wanted to make a card with bright colors and the new stamp, Bloom Wildly, from Two Paper Divas was perfect! I used Inktense pencils to color the image. Hope you had a nice weekend. I had some time to make some cards and this is one of them. It's for Kortskissen and sketch #330. 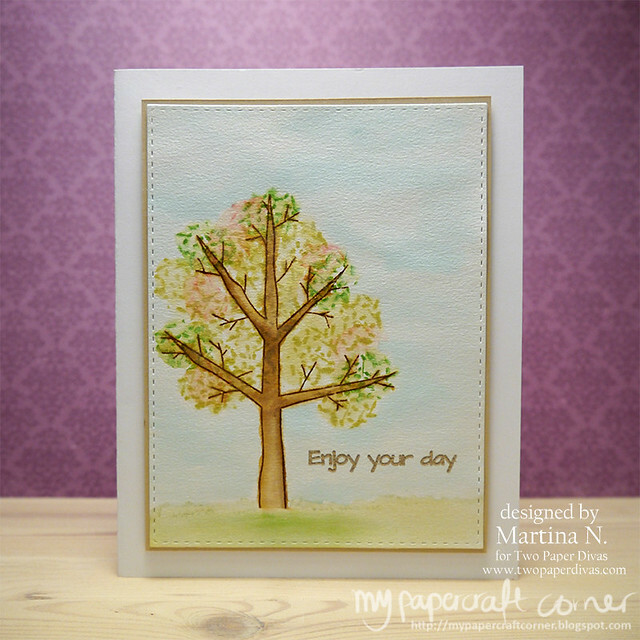 You can find the sketch and the other beautiful cards from the team here Kortskissen #330. 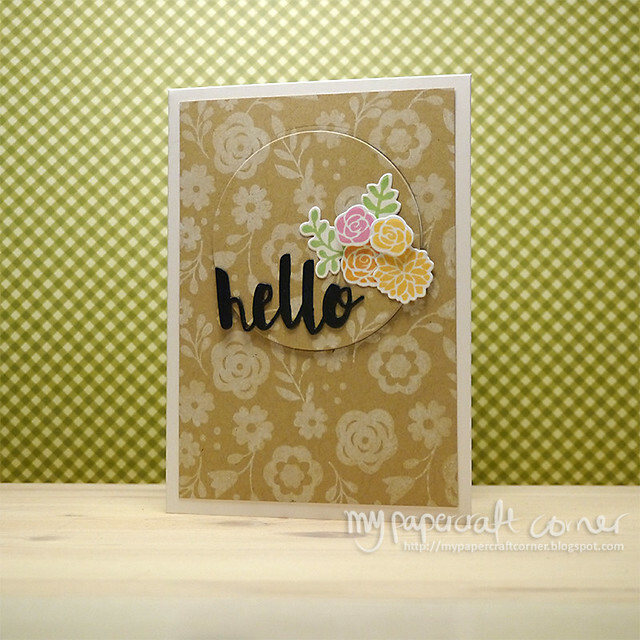 For this card I used patterned paper, dies and twine from the Simon Says Stamp Card Kit, October 2015. I used a stencil I made before with my Silhouette Machine, used Versamark Ink and then Perfect Pearls on that to create the background. For the word I put together three layers of cardstock and coated it wth Brilliance Gold Ink and then added some layers of clear embossing powder on top of that to create some dimension. 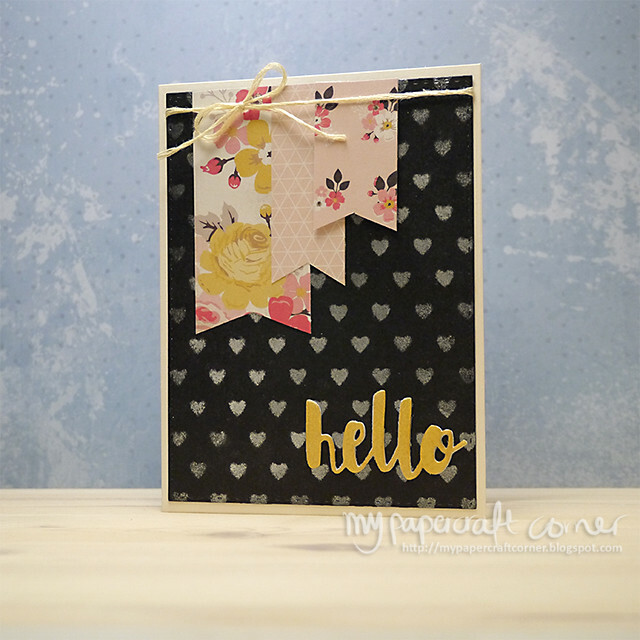 This weekend I had the opportunity to start playing with the Novemeber release of stamps from Two Paper Divas. 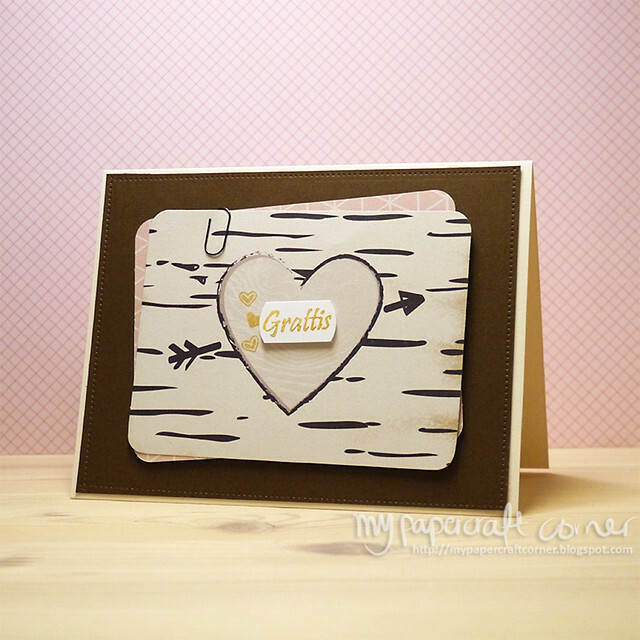 I love bakground stamps so I wanted to make a more masculine card with one of the stamps from the Background Stamps #1. New sketch from Kortskissen and this is my card. Hope you had a nice weekend and holiday. 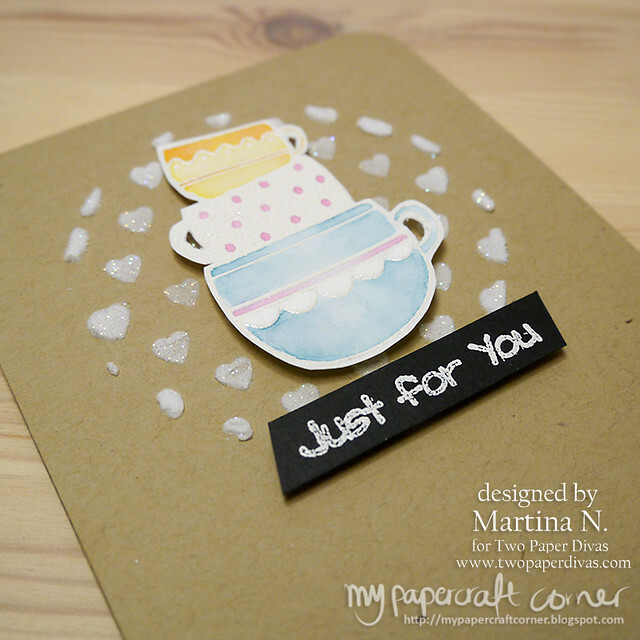 This is the card with stamps from Two Paper Divas for this week. 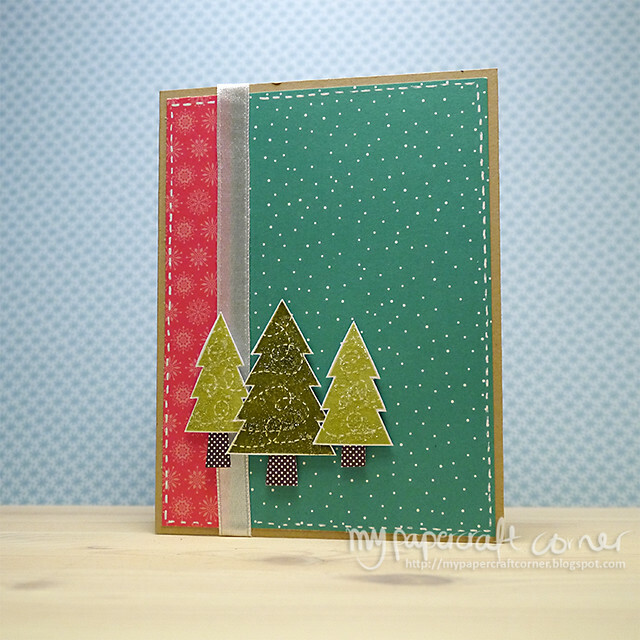 I made another holiday card with the Truffles Treats stamps sets. 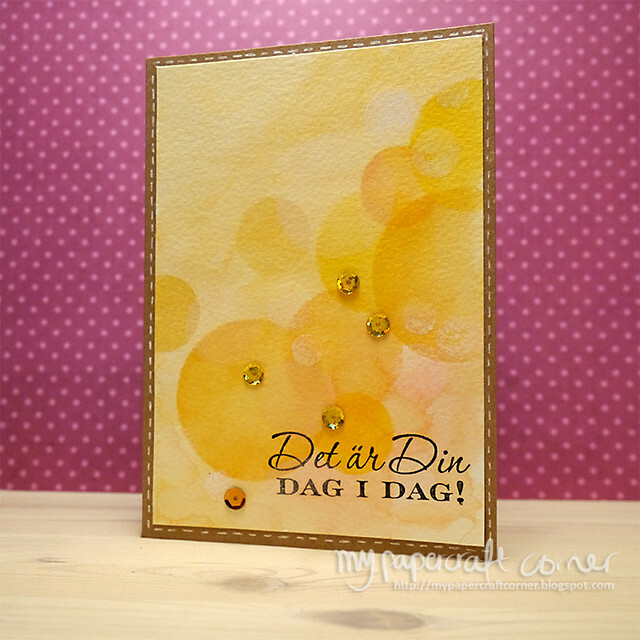 Monday again and I'm sharing another card based on a sketch from Kortskissen #324. 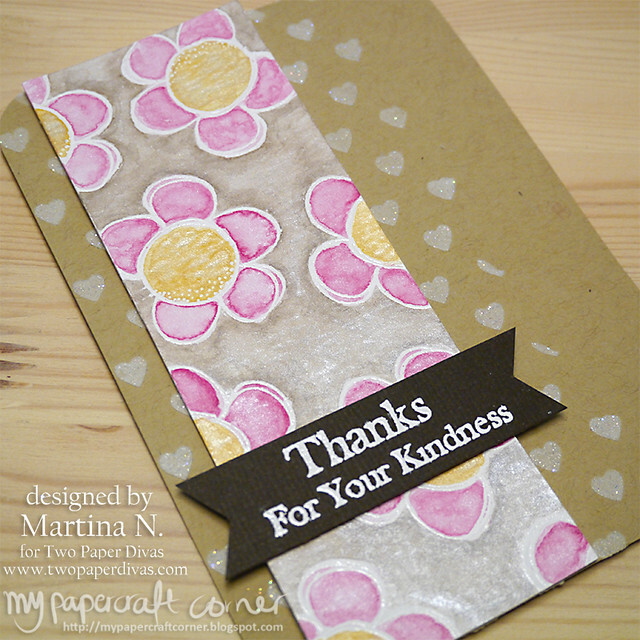 I didn't use any stamps for this card, just patterned paper, a label sticker and some flowers and my own handwriting. I have forced myself to use up some of my precious patterned paper that I seem to save and not ever use! Hope you have a nice weekend. I've taken the latest class from Online Card Classes called Watercolor for Card Makers: Exploring Mediums. The second day I made this card creating a blended background with my Kuretake Gansai Watercolors. This is my latest card for Kortskissen #323. 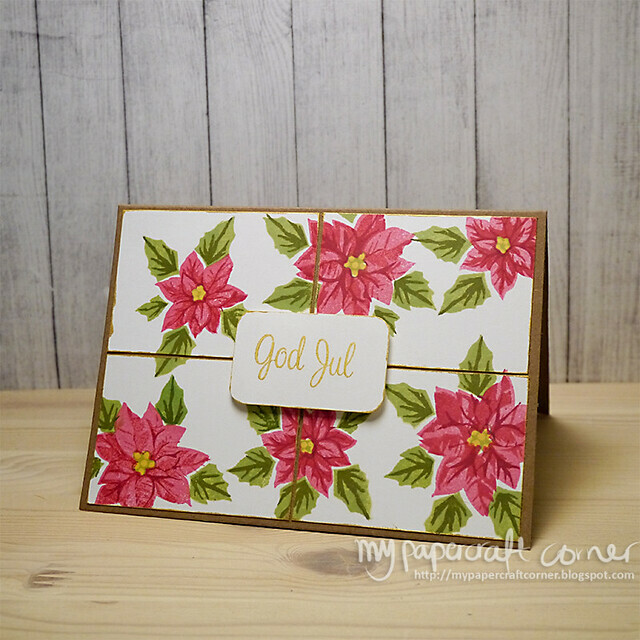 I used an older stamp set from Simon Says Stamp and a greeting stamp from Forma Hantverk to create a small flower scene. Check out the other interpretations of the sketch for this week here Kortskissen #323. Stamps from Simon Says Stamp Flower Friend, greeting stamp from Forma Hantverk. Inks from Avery Elle, Hero Arts, Versafine. 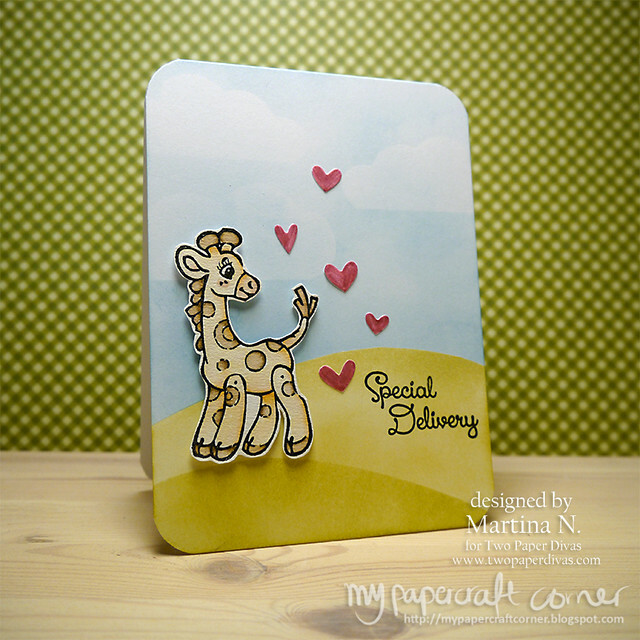 I love this new stamp set from Two Paper Divas, the giraffe is just too cute! I made, almost a one layered card. I created my own masks for the hills and clouds to create the background with Distress Inks and foam applicators. The hearts are cut out with a die from Simon Says Stamp and I colored them with Distress Markers and then some glitter. It's time for a new card for Kortskissen #322. I wanted to play with gold and glitter so I used a lot of embossing powder on this card. I also added some watercolor. Please check the other card and get inspired on Kortskissen #322. Hope you had a nice Saturday. 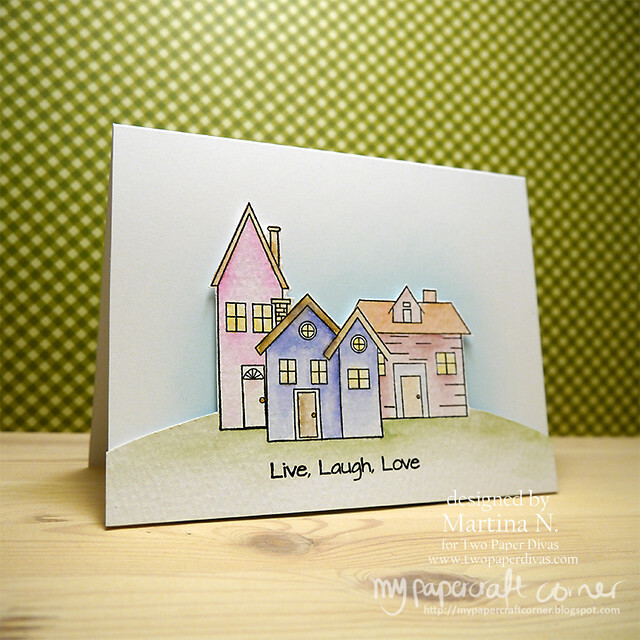 Today I'm sharing a card I made based on a sketch from Freshly Made Sketches 203. The stamps I used comes from Two Paper Divas, All Stacked Up and Banners #3. Hope you had a nice weekend! We are starting the new week with a sketch from Kortskissen #321. 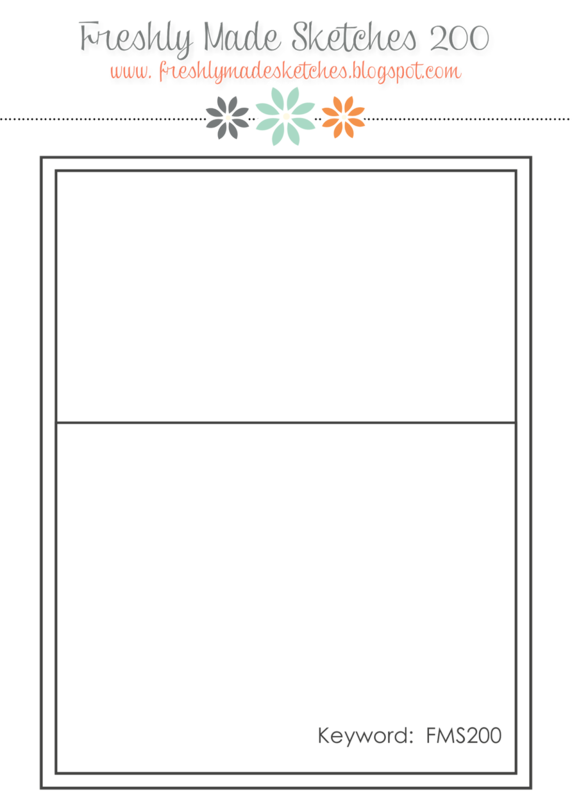 This time I made a card without any stamps. See the other beautiful interpretations on the blog, Kortskissen #321. 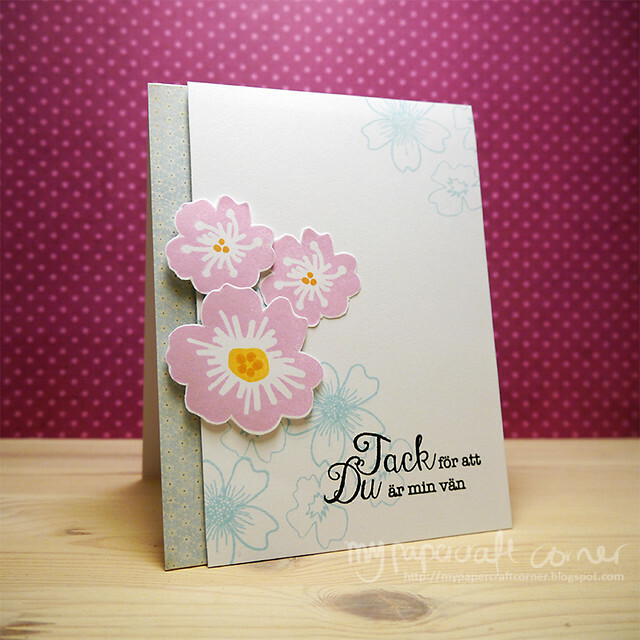 New week and a new card with stamps from Two Paper Divas. I don't want to accept that it's fall yet so I wanted to get some spring-feelings and I used light colors for the card. 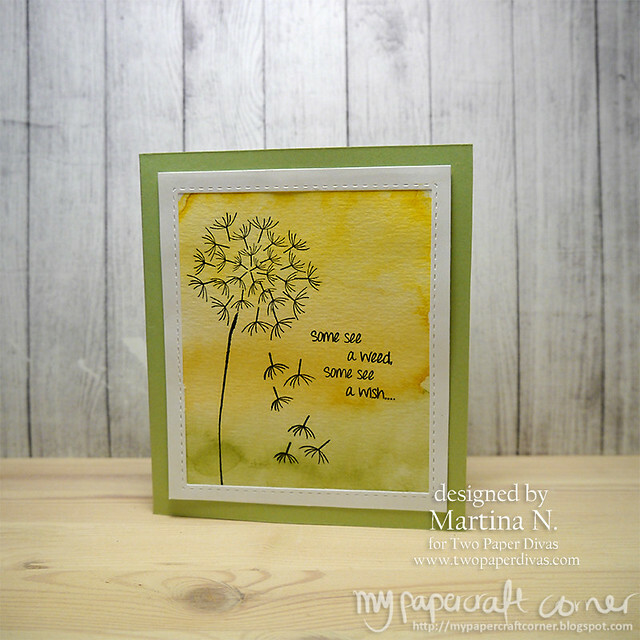 I stamped the image with different Distress Inks and then softened the colors to get the more loose watercolor effect. The sentiment is embossed with platinum embossing powder from Ranger. Inks: Versamark and Distress inks. Stitched die from Simon Says Stamp. It's time for a new card based on a sketch from Kortskissen #320. I hope you have a great week. I don't mind it's Friday tomorrow! 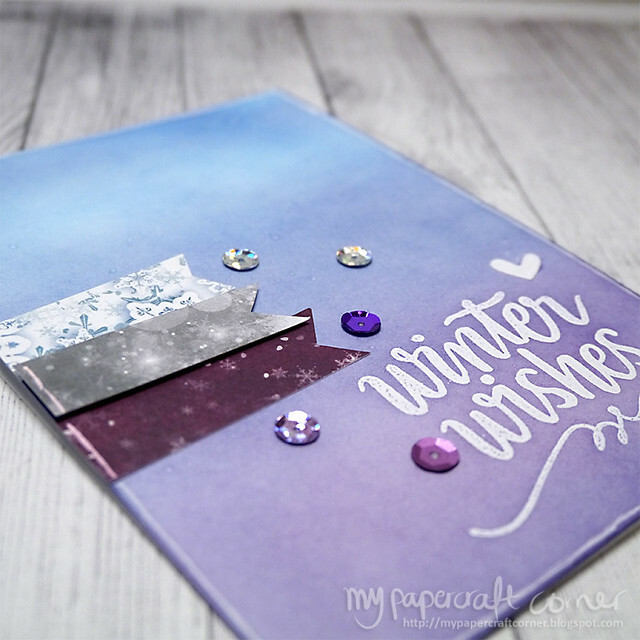 I made this card tonight with some new stamps from Two Paper Divas. I masked the house and I wanted to practice some more watercoloring, this time with Distress Markers. The background is colored with Distress Ink. I used the sketch from Sweet Sunday Sketch Challenge 283. New week and what could be better than start with a new card based on a sketch from Kortskissen #319. I'm also entering the card to Simon Says Stam's Flickr Challenge where the theme is Play with Pastel. I really wanted to make a card with soft colors and since I love flowers I used flower stamps from different stamp sets. The sentiment says Thank's for being my friend in Swedish. Stamps from Hero Arts, Slöjd detaljer och Simon Says Stamp (Flower on my minds, Thinking of you). Hero Arts ink and Versa fine black ink. Hi. hope you had a nice weekend! 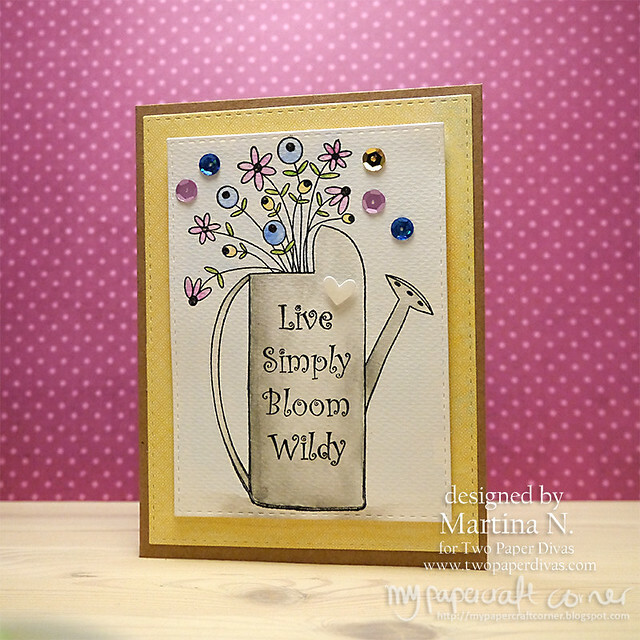 It's time for a new card made with stamps from Two Paper Divas. I used the theme from Less is More where they, last week, had a challenge with congratulations theme. 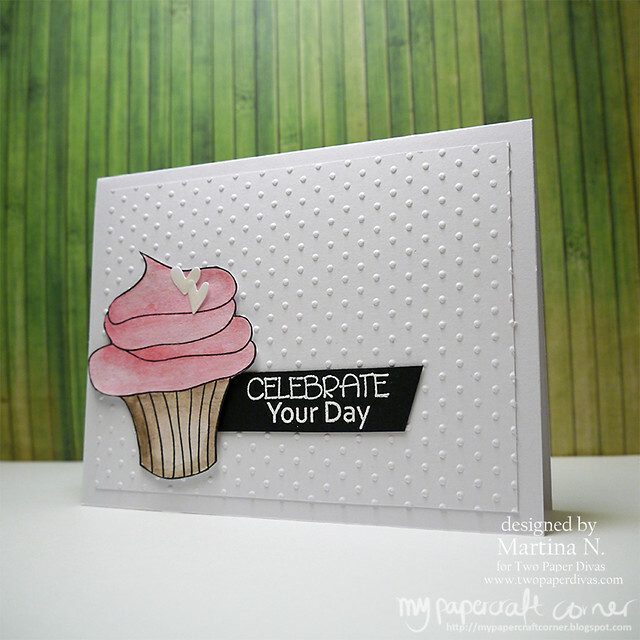 The cupcake stamp and the sentiment comes from Two Paper Divas. I colored the cupcake with Distress Markers. 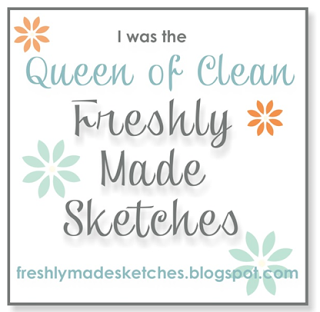 Today it's a special day, it's Freshly Made Sketches #200 celebration! 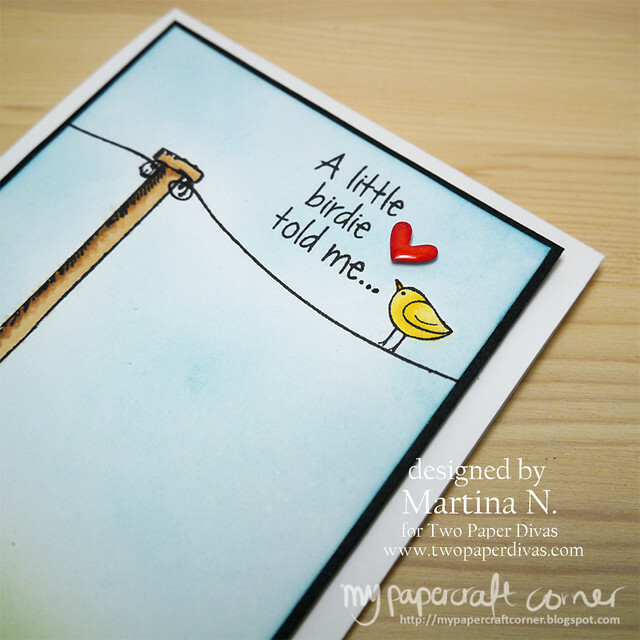 Two Paper Divas is one of the sponsors so I'm sharing a card with stamps from them and based on the #200 sketch. I used Distress Inks for the background and some masking. The images are colored with Copic Markers. Please go and check out the other cards and stamps and I hope you'll get a lot of inspiration. Have a nice day and thank you so much for stopping by. 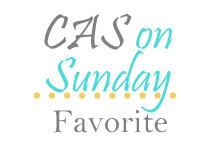 Today I'm sharing a card made based on a sketch from CAS(E) this Sketch #136. I had a lot of fun playing with my watercolors again. 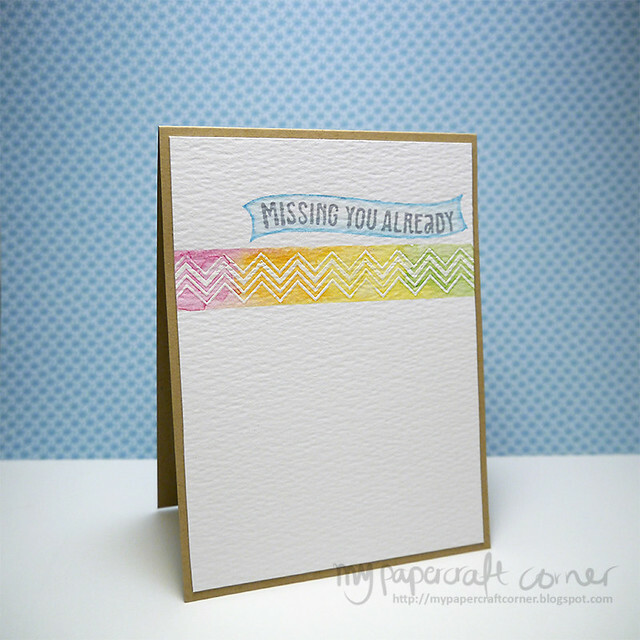 I masked of an area on a watercolor paper and then stamped and white heat embossed the zig zag border. I then colored over it with watercolors mixed with some shimmer from the watercolor set. Unfortunately it's hard to see in the photo. The banner is a stencil that I traced with a Distress marker and then added water to fade the color. I stamped the sentiment with ink from Hero Arts. It's time for a new card for Kortskissen. I wanted to stay in my summer-mood and use summer colors so it turned out to be a card with very bright colors! 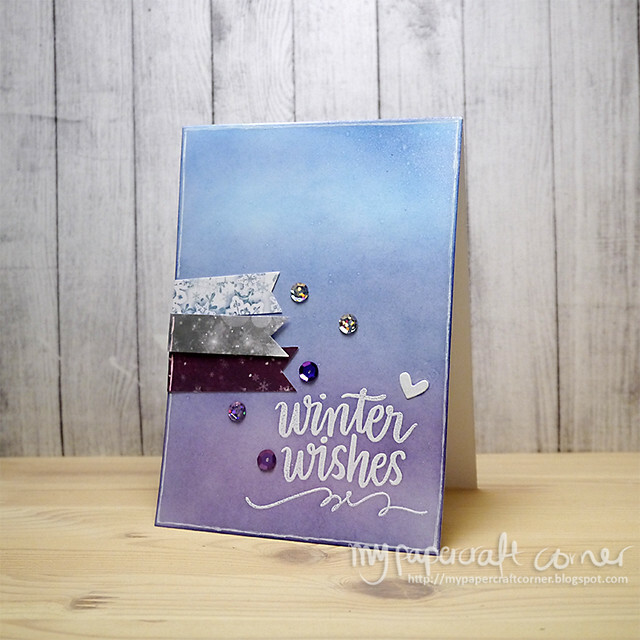 Please go and check the other beautiful cards here Kortskissen 318!